There has been some discussion as to whether aircraft carriers are obsolete or far too costly. Cruise missiles fired from bombers, destroyers, cruisers or submarines can strike targets at a far lower total cost. Political leaders now ask if the USA afford 12 "supercarriers", in addition to 13 LHD/LHA "helicopter carriers" which also operate Harrier fighter-attack aircraft, are larger than American World War II carriers, and any foreign aircraft carriers today. Does the USA need 25 aircraft carriers? The biggest problem is that new carrier aircraft cost twice as much as those they replace, even after adjusting for inflation. The Navy maintains 10 Carrier Air Wings (CAWs), one less since one carrier is always undergoing an extensive multi-year overhaul, and another was deleted a few years ago due to a lack of aircraft. A shortage of aircraft has resulted in the number of fighter-attack aircraft deployed with each CAW to fall from 50 during the 1990s to around 36, typically with 26 F/A-18Cs and 10 F-14s. Even with planned budget increases, the Navy cannot afford to fill each carrier deck with its goal of 48 fighter-attack aircraft, giving rise to speculation that two carriers will be trimmed from the fleet. However, the Navy can retain all its carriers if it takes three steps to save billions of dollars while improving the value of CAWs. While the cost effectiveness of carrier strike missions is debated, their value to attack moving targets and provide close air support is unquestioned. Marine Corps pilots are specifically trained at close air support and can provide the staff of CAWs with valuable insight and skills. The Marine Corps has 21 active-duty fighter-attack squadrons, eight F/A-18C and six F/A-18D (two seat) squadrons with 12 aircraft each; and seven AV-8B squadrons with 16 aircraft each. The AV-8B "Harrier" aircraft deploy and support forward deployed Marine units from the smaller LHD/LHA carriers. However, the F/A-18 squadrons have no real peacetime role. They continue Cold War deployments to Iwakuni, Japan, where one squadron is permanently based and two others are maintained through six-month rotations. There is no need for Marine squadrons to continue these costly deployments to a region which has overwhelming US and allied airpower. Several years ago, the Navy lacked aircraft to fill out its CAWs, so the Marine Corps agreed to assign four F/A-18 squadrons. This has worked well over the past decade and should be expanded to cover the growing shortage of Navy carrier jets. The Marine Corps should assign 10 F/A-18 squadrons to the 10 CAWs, to allow the Navy to return a CAW to service and reduce op-tempo. This would still leave three Marine squadrons for other missions, which could be permanently based at Iwakuni if Generals insist. If a major war occurred, the Marines have seven AV-8B squadrons, four F/A-18A squadrons in the reserves, and Navy reserve squadrons could relieve some carrier-based Marine squadrons to transition ashore. It makes no sense to deploy multi-billion dollar carriers overseas without a full complement of aircraft while carrier-trained Marine Corps squadrons sit back home or in peaceful Japan. If this upsets some Marine Generals, then perhaps these aircraft and their manpower funding should be shifted to the Navy. However, if Marines are serious about being "First to Fight", they should eagerly accept the idea of using Navy aircraft carriers to forward-deploy. 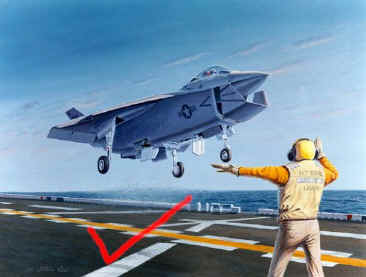 There is no need for a Navy "catapult" carrier version of the Joint Strike Fighter (JSF), which requires a larger wing, strengthened fuselage, catapult attachment points, improved landing gear, and other modifications. This will cost an additional billion dollars to finish development and testing. Since the Navy plans to buy just 300 JSF aircraft, it should simply buy the (Short Take-Off and Vertical Landing) STOVL version, of which 642 are planned for the Marine Corps and 60 for the Royal Navy, with possible sales to Italy, Spain, and even the US Air Force. Including one STOVL JSF squadron in each CAW would add new capabilities. Carrier operations during adverse weather are very difficult, and almost impossible with ice. STOVL JSF aircraft can operate safely in any conditions. Although the prospect that Navy ships may suffer combat damage seems remote today, STOVL JSF aircraft could operate from a damaged carrier deck. During the 1991 Persian Gulf war, 20 Marine STOVL Harriers operating from the USS Nassau proved that an aircraft carrier can launch a STOVL squadron four times faster than one requiring catapults, which is very important when reacting to threats near shore. Navy STOVL JSF could also operate from smaller LHD/LHA carriers if necessary, which may become vital if the number of super-carriers decline. STOVL JSF aircraft could be attached to almost any Navy ship for a variety of missions. Finally, STOVL aircraft can make emergency landings on any ship or flat surface, an important advantage during chaotic combat operations. STOVL JSF aircraft can provide aircraft carriers with unique capabilities to complement those of the F/A-18s. Ironically, a truly "joint" STOVL variant of the JSF would save almost a billion dollars in development and simplify training and maintenance for the Navy/Marine team. 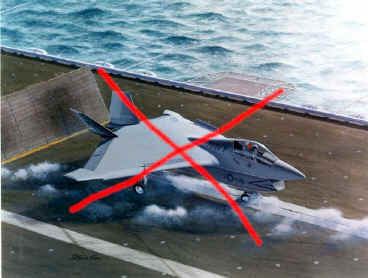 Most carrier pilots will oppose a STOVL JSF because they are too easy to operate from carriers, which is hard to understand, but true. The Navy carrier-version is planned to carry 4,000lbs more payload, but this does not outweigh the advantages of the STOVL version. Imagine a pair of STOVL fighters detached to a cruiser to greatly expand the fleet air defense perimeter. Imagine STOVL fighters landing on destroyers to refuel, or sitting on their decks on alert rather than clogging a carrier's busy flight deck. Navy STOVL is so logical that even retired Admiral Bill Owens of SAIC has advocated the idea. For many years, the Marine Corps has debated the need for a dedicated attack aircraft like the Air Force A-10. The A-10 "Thunderbolt II" aircraft was specifically developed as a close air support aircraft with reliability and maintainability as major design considerations. The Air Force requirement documents emphasized payload, low altitude flying capability, range and loiter capability, low speed maneuverability and weapons delivery accuracy. About 30% of A-10s are modified as OA-10s forward air controllers, which use the A-10s longer loiter capabilities to orchestrate air strikes. The A-10/OA-10 have excellent maneuverability at low air speeds and altitude, and are highly accurate weapons-delivery platforms. They can loiter near battle areas for extended periods of time and operate under 1000-foot ceilings with 1.5-mile visibility. Thunderbolt IIs have Night Vision Imaging Systems (NVIS), compatible single-seat cockpits forward of their wings and a large bubble canopy which provides pilots all-around vision. The Thunderbolt II's 30mm GAU-8/A Gatling gun can fire 3,900 rounds a minute and can defeat an array of ground targets to include tanks. Other equipment includes an inertial navigation system, electronic countermeasures, target penetration aids, self-protection systems, and AGM-65 Maverick and AIM-9 Sidewinder missiles. Specific survivability features include titanium armor plated cockpit, redundant flight control system, separated fuel tanks, two rear mounted engines, manual reversion mode for flight controls, foam filled fuel tanks, ballistic foam void fillers, and a redundant primary structure providing “get home” capability after being hit during dangerous close air support missions. The aircraft can survive direct hits from armor-piercing and high-explosive projectiles up to 23mm. Their redundant hydraulic flight-control systems are backed up by manual systems to permit pilots to fly and land when hydraulic power is lost. The Air Force currently has 368 A-10s and OA-10s in active and reserve squadrons, and 149 in storage (see Air Force Boneyard stats; it takes a long time to load, the MDS in the right column is the aircraft type). 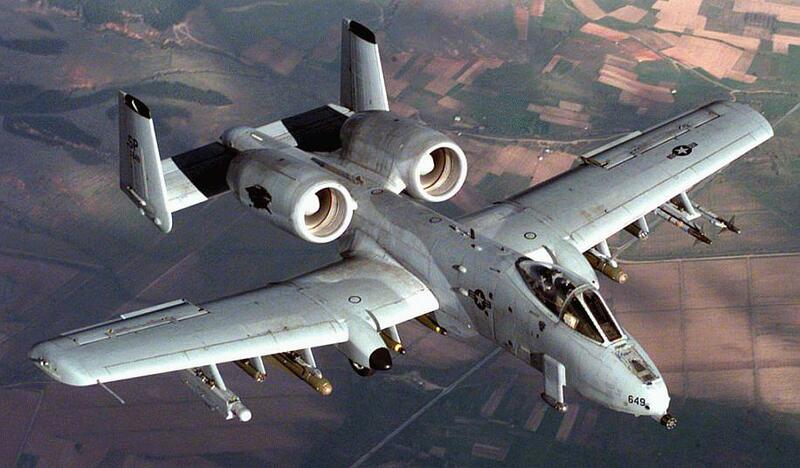 The Marine Corps should modernize these surplus A-10s to replace their aging F/A-18s starting in 2006. The surplus A-10s in storage can begin overhauls in 2004, perhaps earlier if the Navy needs some Marine F/A-18Cs to fill its squadrons until more F/A-18Es arrive. This will provide 8 A-10 and 4 OA-10 Thunderbolts for each of 10 Marine attack squadrons (120 aircraft plus 39 for pilot training and spares). Modifications for a Marine Corps A-10 "Sea Hog" should only require folding wings, a tail hook, and a catapult attachment point. The Air Force is currently upgrading its fleet of A-10s with better electronics and targeting equipment, so there would be no development costs as the Marines simply join in the Air Force program. The A-10 uses the same TF34-GE turbofan non-afterburning engine as the Navy S-3 carrier aircraft now used primarily as refuelers. This Navy supported engine produces less noise and heat, which is advantageous for an attack aircraft. The A-10s straight wings allow slower flight, making them ideal for carrier operations. The heavily armored A-10 was built to operate from primitive airfields, so it already has strengthen landing gear. These "Sea Hogs" should cost only around $20 million dollars to overhaul and modernize, compared to around $80 million for each new JSF-STOVL. The Corps would still need 300 JSF-STOVL to replace its AV-8B Harriers and the other three active and four reserve F/A-18 squadrons, unless more A-10s are absorbed as the Air Force begins to retire its A-10s in 2018. A squadron of Marine Corps A-10 "Sea Hogs" can provide each Navy CAW with new capabilities to engage ground forces with a custom built attack aircraft, while saving almost $2 billion in future procurement costs. Each CAWs now deploys short a dozen fighter-attack aircraft, and one CAW was already disbanded. Even with planned budget increases, aircraft carriers will go to sea with fewer aircraft each year. Political leaders must force Admirals to accept realistic options. These three proposals can save the US Navy billions of dollars over the next decades. It would allow the overall production goal for the F/A-18E to be cut in half. However, all the services have an urgent need for a new electronic jammer to replace the aging EA-6B. The obvious solution is a two-seat F/A-18G "Growler", which would offset some cuts to the F/A-18E program. The JSF-carrier version would be cut outright, while the JSF-STOVL remains unchanged as 300 go to the Navy and 300 to the Marines, while the Marines modernize and upgrade 149 A-10s. The future of carrier aviation and carriers themselves is fuzzy, unless the Navy-Marine team combines to save money while improving the value of CAWs.